Lead to Life & Permaculture Action Network invite you to the Sogorea Te’ Land Trust and Planting Justice Nursery in East Oakland for a Permaculture Action Day on Sunday, January 20th. This is a free, family-friendly event filled with ecologically regenerative hands-on projects, workshops & skill-shares, music, and a community meal. This is the sister event to this past April’s Lead to Life series in Atlanta, Georgia, where 50 guns were melted down into 50 shovels to plant 50 trees in honor of the 50 years since MLK’s assassination. We will use these shovels again this January 20th, 2019, to plant trees, install regenerative systems, and build ceremonial space. For this occasion, our partners RAWtools & James Brenner have forged a reimagined arsenal of garden tools made from weapons. Folks from across the East Bay are coming together to use these ceremonial tools towards two revolutionary land regeneration projects on 105th Ave in East Oakland. This day will be an act of beloved community and grassroots liberation as part of Oakland’s annual weekend to reclaim the radical legacy of Martin Luther King Jr.. To honor the vision of Dr. King, the work of people across Oakland, the significance of the Jewish tradition of Tu Bishvat, and the indigenous stewardship of these lands, we will work with our hands in the soil to decompose colonialism. We will live into a practice of land reparations, through supporting the return of Ohlone ancestral homelands. Bring your friends and come prepared to learn new skills, build food-producing systems, and have a dirty, good time!! Sogorea Te’ is an urban, indigenous women-led organization that facilitates the return of Chochenyo and Karkin Ohlone land in the San Francisco Bay Area to indigenous stewardship. The Sogorea Te’ Land Trust site at Planting Justice’s East Oakland Nursery is the first piece of land put into the community land trust, and will be the site of the first ceremonial arbor built on Ohlone Land in 250 years. Planting Justice facilitates permaculture designs and installations for homes around the Bay Area and regenerative educational programs, hires formerly incarcerated folks at a family-supporting wage, and now runs the largest organic fruit, nut, and berry nursery in California right out of a two-acre site in East Oakland. This is Permaculture Action Network’s 92nd action day in which communities brought together through a cultural event are invited to direct their energy into hands-on projects that improve regenerative common spaces and bring forward a just and regenerative world. Abundant Earth Foundation helps support permaculture and social justice projects around the world through grassroots philanthropy. The schedule for our Permaculture Action Day! *Learn more about this year’s gatherings below! 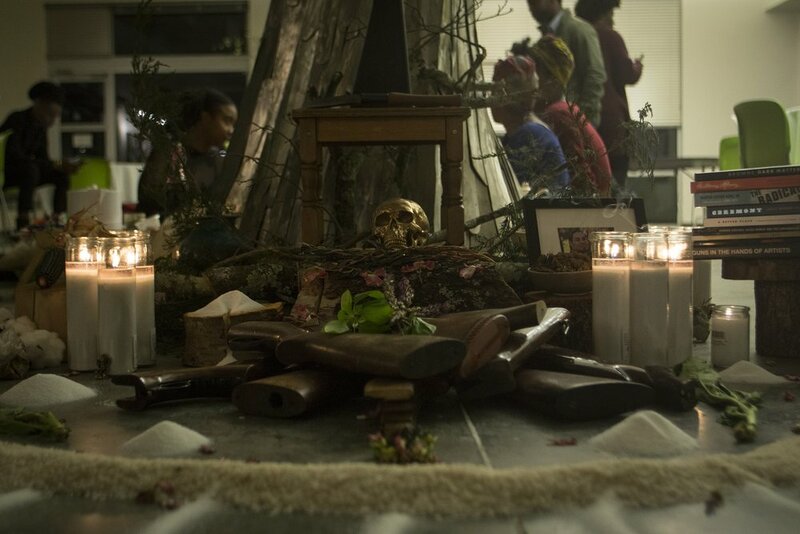 In partnership with the Robby Poblete Foundation and United Playaz, we will be hosting a live metal alchemy ceremony to transform guns into shovels, and to call in the prophetic future we know is possible. Our ceremony will serve as a conclusion to the 5th Annual People’s March to Reclaim King’s Radical Legacy, organized by APTP. This weekend will be an act of beloved community and grassroots liberation as part of Oakland’s annual weekend to reclaim the radical legacy of Martin Luther King Jr.. To honor the vision of Dr. King, the work of people across Oakland, the significance of the Jewish tradition of Tu Bishvat, and the indigenous stewardship of these lands, we will work with our hands in the soil to decompose colonialism. We will live into a practice of land reparations, through supporting the return of Ohlone ancestral homelands. Thank you to everyone who joined us in ATL this past April! Stay on the lookout for more information on joining upcoming gatherings in Oakland/occupied territory of the Ohlone people in January 2019 throughout the King holidays. Lead to Life hosted a powerful “Time for Healing Justice” from March 29th - April 8th, 2018 in Atlanta, GA to honor the 50th anniversary of Dr. King’s assassination. The prayer for our work in Atlanta was to re-weave (the often made separate) threads between environmental racism, gun violence/state violence, the history and trauma of slavery, and environmental degradation. This commitment iterated through a week of gatherings in Atlanta connecting rest as reparation spaces for Black folks to participatory alchemy ceremonies where we transformed weapons into shovels to plant trees. The 50 shovels made from weapons have been distributed to black farmers, families, and artists around Atlanta to continue using in service to justice, food sovereignty, and healing. You can view a short film on our time in Atlanta here. 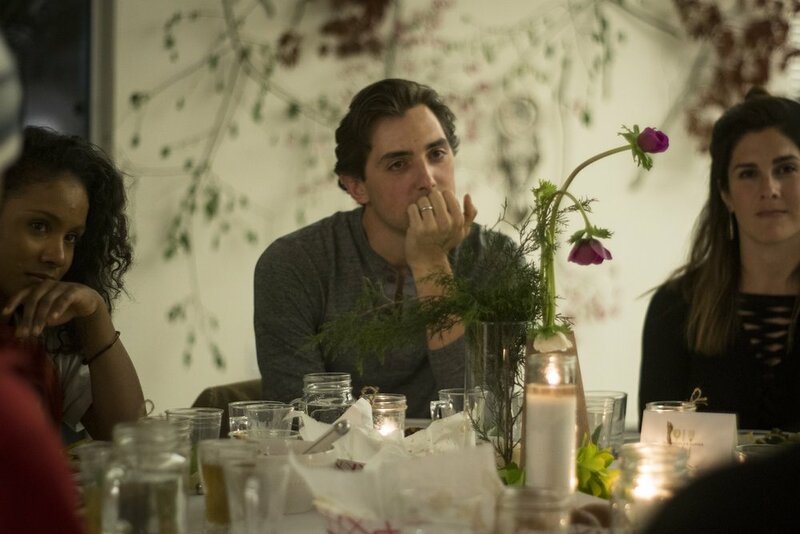 On the evening marking the 50th anniversary of Dr. King’s Assassination, we hosted The People’s Supper - a community dinner and conversation centered in decomposing violence and environmental racism through radical imagination. 100 people gathered through fellowship and nourishment to invoke the sacred memory of Dr. King’s legacy. The “beloved community” in assembly that evening bridged intergenerational folks in Atlanta working across disciplines, practices, geographies, class, and experiences. 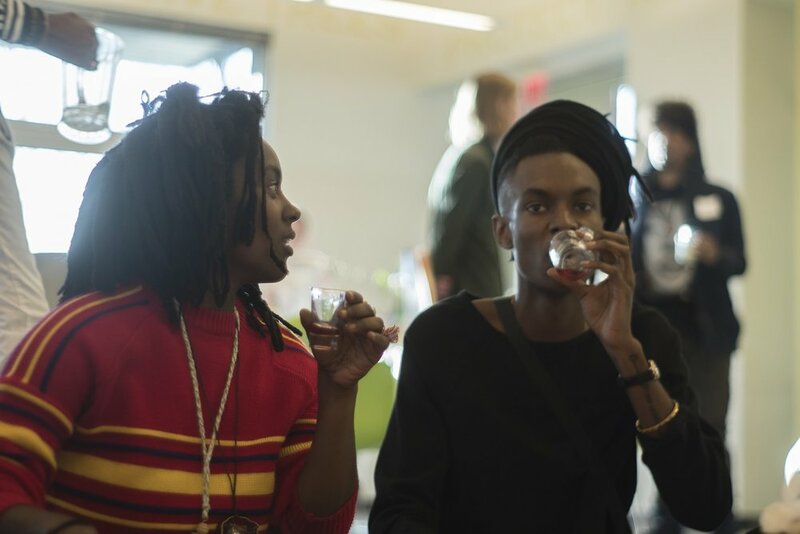 Chef Maricela Vega of Chicomecóatl and Mike Sheats from The Plate Sale served a southern-influenced meal rooted in the histories of African + Mesoamerican diasporic cuisine inspired by the last meal that Dr. King never had the opportunity to eat. We lived into the question, What is Dr. King’s dream asking of us at this time in our current context? 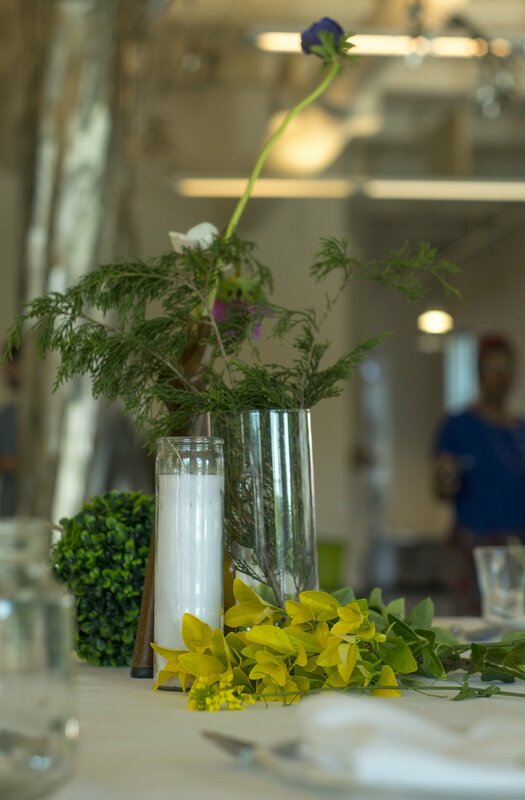 Lead to Life co-hosted the dinner with #ChopItUpATL & ThinkTable. Our dinner pedagogy was advised by The People’s Supper, who has teamed up with folks on the ground, schools, faith communities and neighborhood organizations to host 1000+ suppers in cities and towns across the country, most recently for The Obama Foundation & #LoveArmy. On Saturday, April 7th, 2018 we held a Permaculture Action Day in collaboration with Permaculture Action Network at a local black-owned farm - Filomena Andrade’s Farm. This 56-year old Cape Verdean woman has been tending to and cultivating this farm on her own, and we brought in 300 volunteers to help her build a greenhouse, plant sixteen fruit trees with the 50 shovels made from guns, rebuild a chicken coop, build a creek-bed retaining wall, and more! 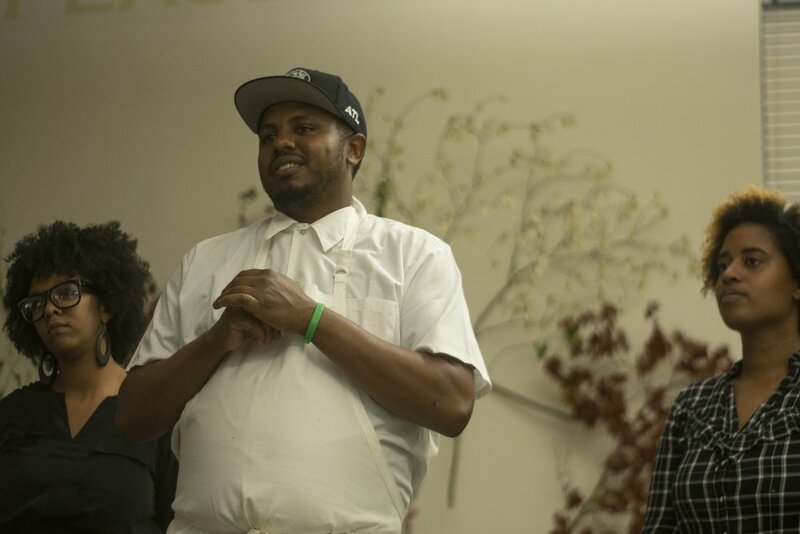 A black mycologist, Will Brown, joined us to teach a low-tech mushroom cultivation workshop and it was many folks’ first time planting trees and being in the garden. The day was graced with radical joy and musical sets from Raury and Rising Appalachia. The King Center and around the King Historic District - One cherry tree was planted in the Corretta Scott King Peace Garden followed by seven street trees around the neighborhood. Families homes who lost their children to gun violence - it was incredibly profound to plant life along with the ashes of their children, in prayer and in ceremony. One Gingko and one crape myrtle. Historic Westside Gardens - six fruit trees planted with Westside neighborhood hero, Rosario. We initiated our week of gatherings by holding a soil collection ceremony from the site of a lynching of a brother named Mack Brown who was killed in 1936. Folks who identify as a part of the African diaspora gathered at this site in Roswell, GA.
We collected soil with a RawTools trowel made from a gun. The soil was then sent to Equal Justice Initiative in support of their Community Remembrance Project and National Lynching Memorial, which recently opened in Montgomery, AL., that honors the victims of racial terror lynching. We also collected soil which would then be used for the planting of 50 trees across Atlanta the following week. After the collection ceremony, we rested with the soil in a space curated by Tricia Hersey from The Nap Ministry, to dream into being the healing of the soil, our bodies, our ancestors and future beings. We held two participatory guns-to-shovels ceremonies in Atlanta where we invited community members into the transformation of 50 guns into 50 shovels. On April 4th, the 50th anniversary of Dr. King’s assassination, we held a guns-to-shovel ceremony at The King Center where we delivered a weapon to Dr. King’s daughter and CEO of The King Center, Bernice King - her first time holding a gun. She then processed to a furnace to deliver the weapon to our metal casting artist Jim Brenner to be transformed into a shovel. Mothers directly impacted by gun violence also joined us to share their stories and experiences. Kai Koerber and Tyah-Amoy Roberts, black youth who were victims of the Parkland shooting at Marjory Stoneman Douglas high school were also present to share their stories - specifically in the ways their experiences, in the larger reverberations of gun violence against black folks, has been ignored and silenced in the midst of other white and white-appearing students voices being privileged. Their presence asked whose children's cries do we choose to hear, whose lives do we prioritize in the face of horror, who calls us to move, to say #neveragain? On Friday, April 6th, 2018, we held a public ceremony for over 100 people in an empty lot off of Auburn Ave, a block away from The King Center. Drums and music held the heart of the space.Corrina Sephora, local Atlanta blacksmith transformed a gun barrel into art through a participatory performance with folks who were present. Mothers and families directly impacted by gun violence shared their stories - including the families of X’avier Arnold,Jamarion Robinson,Robby Poblete and Jayvis Benjamin. One by one, family members delivered guns to the furnace to be transformed by metal casting artist Jim Brenner and his team. The shovels read, “As we decompose violence, may the earth again be free.” The backs of the shovels have inscriptions to honor those we have lost to state violence. Such as “Giving breath in honor of Eric and Erica Garner”, “Giving breath in honor of Marielle Franco”, “Giving breath in honor of Jamarion Robinson.” Our shovels honor those lost to state violence - we use them to replant an earth that protects, honors and loves black folks. To honor Martin Luther King Day 2019, Lead to Life invites you to dream into and create our post-capitalist, post-white supremacist, post-colonial world, where the police state surrenders their weapons for the people to melt them into shovels to plant life that regenerates the land. Together, we will create a live alchemy ceremony that honors the transformative decomposition of violence. The future we are envisioning is now. The ceremony will follow the annual Reclaim King march - inviting residents of the Bay Area (occupied Ohlone territory) to liberate a future where Dr. King’s vision is realized 50 years after he was assassinated. Our metal casting artist James Brenner alongside local East Bay metal artists, will lead us in a live demonstration of making tools from weapons. The guns have been donated by our partners the Robby Poblete Foundation & United Playas, who collected them from volunteer gun buy back days across the Bay Area. Join us as we gather in prayer, in grief, in praise, and in creative action to reimagine violence and to decompose White Supremacy in our city, our country, and our world. Community members from the Oakland area who have been directly impacted by gun violence are invited to offer disabled weapons into the fire to be transformed. Other community members are invited to gather in solidarity and prayer to bear witness. The shovels we make together will be used in tree planting ceremonies in honor of Earth Day, April 2019, where we will plant 50 trees at sites impacted by violence, and sacred sites across Oakland. This ceremony sustains a prayer cast in Atlanta, GA in April 2018 where we transformed 50 guns into 50 shovels to plant 50 trees to honor the 50th anniversary of Dr. King’s assassination. Click here to learn about the beauty that took place in ATL. This ceremony is free and open to all! Tax-deductible donations of $15 - $50, though not required, are humbly appreciated to support our ongoing work to reimagine violence. You can RSVP on our eventbrite page. Click here for information and registration for our Week of Healing Justice gatherings taking place January and April 2019, including the Tree Planting Ceremony, People's Supper and Permaculture Action Day. The following day, Monday, January 21st, we ground this same process in Oakland where we will melt guns into shovels after the People’s March to Reclaim the Radical Legacy of Martin Luther King Jr.
Lead to Life is transforming weapons into shovels for tree planting ceremonies at sites that have been impacted by violence or carry spiritual significance. These guns, donated from the public and collected from police departments, are transformed by metalsmiths into shovels and tools that plant trees to memorialize loved ones, and lands, lost to violence. This event is free and open to all! Bring your friends and come prepared to learn new skills, build food-producing systems, and have a dirty, good time!! RSVP: Register here - https://www.eventbrite.com/e/lead-to-life-reclaim-radical-king-weekend-tickets-54007880023 - to receive up-to-date information on the event location and logistics. The King Center & Lead to Life invite community members, families, and folks working on the frontlines of violence prevention, racial justice and environmental regeneration to join together to plant 50 trees in honor of the 50th Anniversary of King's assassination and the larger reverberations of violence on people and the planet. 50 decommissioned weapons are being transformed into 50 shovels to plant the sacred trees on this auspicious gathering. Lead to Life, Permaculture Action Network and Mena's Farm invite you to join us for a “Permaculture Action Day” of ecological regeneration, workshops, music and radical joy. For this occasion, Rawtools & James Brenner have reimagined and forged an arsenal of garden tools made from weapons. Folks from across Atlanta are invited to come together to work with the Earth utilizing these ceremonial tools— This event is free, and all are welcome to attend! Come by and enjoy a day of hands-on regenerative projects, music, shared food, workshops, meeting new people, and taking action as a community, at a local Black-owned farm! Join us as we gather in prayer, in grief, in praise, and in creative action to reimagine violence in our city, our country, and our world. Lead to Life invites you to The People's Supper: a dinner & conversation centering Healing Justice & Spiritual Ecology 50 years after Dr. King. 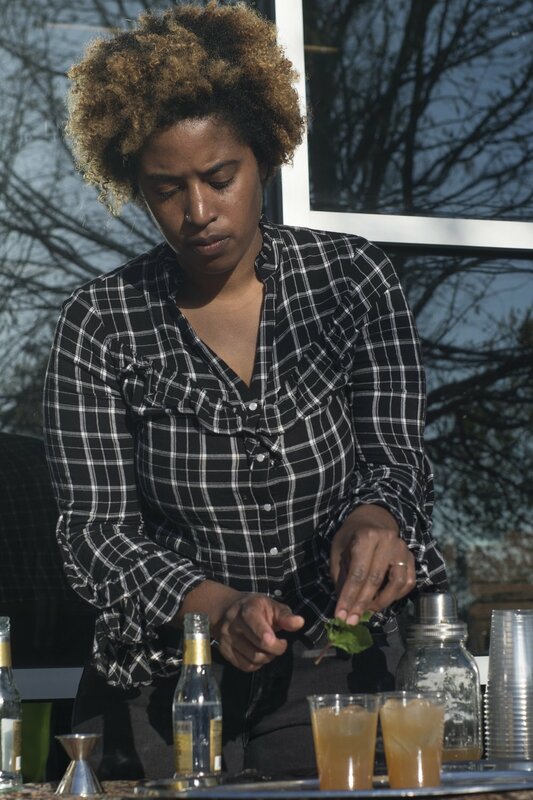 Chef Maricela Vega of Chicomecóatl will be serving up a southern-influenced meal rooted in the histories of African + Mesoamerican diasporic cuisine. Mike + Shyretha Sheats from The Plate Sale are also joining us and preparing the last meal that Dr. King never had the opportunity to eat - it is our intention that we may be nourished by his vision and that we may live into the question, what is his dream asking of us at this time? Produced by Lead to Life, The People's Supper, #ChopItUpATL, and ThinkTable.